Bone and Horn Boxes offered are excellent gift items. Its excellent style and antiqued finish also provides in these gift boxes exclusive finish standards. Further, the hand painting done on the boxes also adds to its finish appeal. These boxes are made of hand carved bone material and due to the quality scrimshaw carving; the figurines are treasured keep sake items. The boxes are available in different sizes and shapes with exclusive designs. 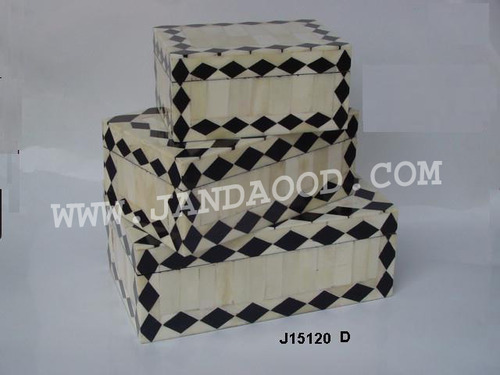 We Jandaood & Company, established in year 1991 are one of the leading manufacturer, supplier and exporter of Decorative Handicraft Products. Our product range include Candle holders, Decorative Candelabras and Aluminium Vases. All our products are precisely quality tested. Ready acceptance of our products by the clients is met owing to functional efficiency attributes and reasonable pricing. Our team of dedicated workforce and talented professionals are competent to achieve the targeted production levels of quality range of products. Our deft quality experts ensure that the products are completely tested to quality parameters in the in-house QC laboratory. A large variety of stock inventory is maintained so as to enable meet out the client’s emergent requirements. Our clients are always eager to look for new products from our firm. Suggestions from clients are always invited along with their feedback for improvisations and betterment of products. Necessary actions are taken up where ever required. Our foremost concern remains to achieve the complete satisfaction of our clients. We take extreme care to monitor all the quality parameters that are desired for performance of the final products before making the delivery to the clients. The products are offered in premium packaging. We export in countries like Europe, Spain, Italy, France, USA, Brazil, Australia, China, UAE.